For a moment, don’t try to defend the empirical data on your shelf, which indicates that speaking to a person indirectly via a Dear Friend letter rather than a personalized letter enhances your charity’s return on investment (ROI). As you read on, listen to your own spirit; for it will guide you to discern a higher truth. This is not to say the data on your shelf is not truth. You’ve quantified it. However, for every one Dear Friend letter analysis that produces a better ROI, there are 10 personalized letter analyses that prove just the opposite. Don’t worry—this isn’t the beginning of some schoolyard one-upmanship that declares, “My analysis is better than your analysis.” However, fundraisers who test and test so they can justify sending their donors an impersonal letter just to save a few pennies per piece are being short-sighted in what they value and measure. As fundraisers, we must have a vision for what we do: What is the ultimate objective for all of your communication efforts with your donors? Today’s donors are looking for relationships with charities that provide a sense of true partnership, a belonging to something greater than themselves. A donor’s vision and passion for making a difference is no different than yours to seek relevance and meaning in your life. Like all of us, donors want to make a statement about what they value, and seek out others with whom to share that experience. Let me impart a new fundraising paradigm: View marketing as something you do for donors and not to donors. Your fundraising is something that serves donors. That service is to match the impact from the benefits and services of your charity to your donor’s passion. Marketing plans and strategies are vital to success. But let me encourage you to write your next plan with a core purpose of building strong relationships in order to foster donor loyalty. This is a strategy that leverages all of your organization’s marketing communication efforts in order to find, develop, and strengthen relationships. An “in-your-face” marketing strategy is short-lived. An “in-your-life” strategy endures. It ensures that what is communicated piques their interest and fulfills their desire to help change the world. Of course, to realize such a paradigm, you must have an organizational culture that integrates all communication channels in order to be responsive and relevant. To change an organizational culture, you must change what you value. We value what we measure. If your vision for marketing is to create and build donor loyalty, then implementing and measuring non-relational tactics, such as a Dear Friend letter, must be things of the past. How do you measure donor loyalty? It is not by evaluating one encounter in isolation, but by assessing “in context” donor behavior at every point of contact. Creating an organizational culture that values and measures donor loyalty is an ongoing process and should be a charity-wide effort. Your organization’s core values must reflect a desire to consistently perform your mission well, and present clear and creative donor-focused communication. Your charity must inspire donors to loyalty. This is accomplished when donors truly feel as part of the effort . . . when they can envision themselves standing side-by-side with you to carry out a worthwhile cause. Let donors in. Your mission and their mission must become one. Then listen to them refer to the charity as “we” and not “you.” The only way to do this is to see donors as champions, just as you are a champion of philanthropy. Hopefully, you’re now beginning to understand how counterproductive a Dear Friend letter is in building a relationship with a person. Can you hear a donor say these words: “I gave them $500 and this charity doesn’t even know my name. What’s the point?” The unfortunate thing is that we know our donors’ names, but rely on some misguided research that tells us that we can save a few bucks if we speak to our donors en masse instead of to their individual hearts. At each point of personal contact along the communication continuum, we have an opportunity to increase the speed of relational momentum. Every moment with a person allows us a chance to deepen our relationship with them. A Dear Friend letter will slow down or even bring an end to the relational momentum. Probably the most damaging thing in not addressing people by name is the impression you leave with them of not really knowing who they are. All of us have experienced that feeling. If you want to connect with people and be remembered and relevant in their lives, then you need to, at a minimum, assure them that you know their names. So where does the Dear Friend letter fit into the context of creating and building relationships? One response may be, “Okay, if not in donor renewal, what about new donor acquisition?” In the case of acquiring new donors, a Dear Friend letter has the exact reverse effect on a person. People may become cynical with the cavalier use of the word “friend,” for they know that neither you, nor they, have had prior contact and are not indeed, friends. Somewhere in our journey as direct marketers we lost perspective on what’s most important and what we should value. We’ve harnessed the power of technology, not to become more human, but to analyze and measure how to become less human. And, in doing so, we became penny wise and pound foolish in our efforts to raise money. Expand your mind to encompass the possibility that your role in our great effort is to inspire and cultivate hearts toward your cause. Forget the “you” mentality and begin to embrace donors as real friends. While many worthwhile charities focus solely on the “donor dollar,” you can out-maneuver them by focusing 100% on making your donors feel extraordinary. A widely accepted truth is that it costs at least five times as much to acquire a new donor as it does to keep an existing one happy. Most certainly by now you will agree that using a donor’s name is one way to keep them happy. Therefore, I say, “Death! 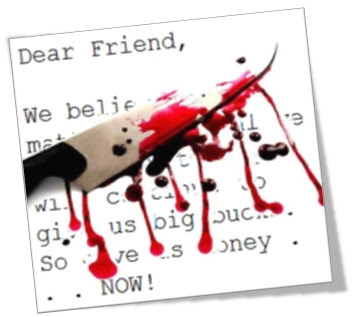 Death to the Dear Friend letter!” May the idea never be entertained in the minds of fundraisers again. Go and gather what remains of these misguided efforts and burn them in effigy. P.S. Let’s really take that trip to Key West. We’ll chat for hours, listen to Jimmy Buffett because he’s singing for change . . . the first round of margaritas is on me.